Wonderful things happen when talented people join together in a creative process. 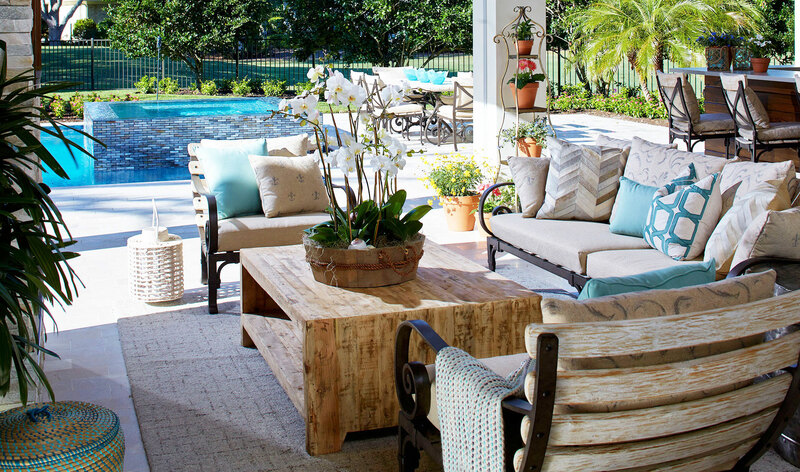 When Leslie Sherman of Calusa Bay Development began work on this 5,700 square foot home in Pelican Bay, she assembled a team comprised of top professionals who all share a common vision — to design and build exceptional, functional, unique living spaces. From an architect renowned for his impeccable design sense, to a general contractor with an eye for unique millwork design and incredible attention to detail, this team worked together to create a home that encompasses the best of modern living with classic design elements. 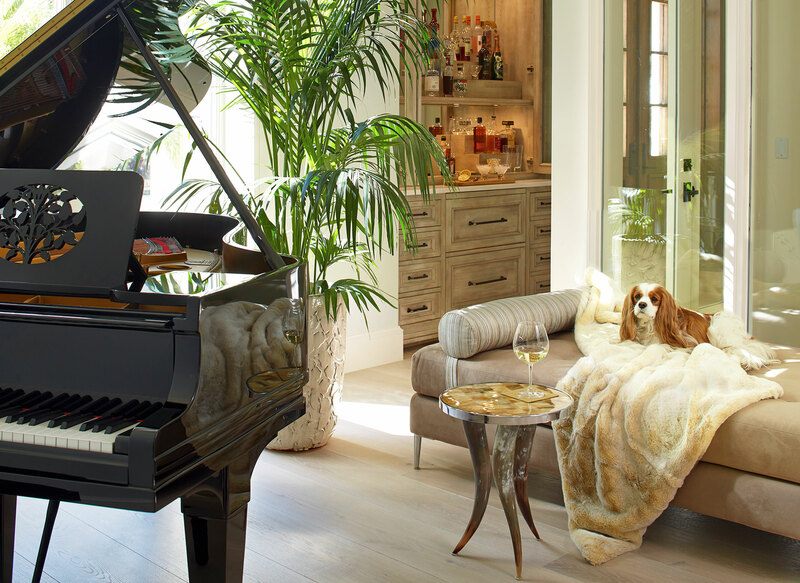 A stroll through the great room ends in the music room, where the home’s antique Steinway baby grand piano, shown here bathed in afternoon sunlight, is the focal point. A perfect spot to relax with a glass of wine and read a book, or take a nap with your favorite friend, the music room also hosts a glass enclosed 350 bottle wine room and a gorgeous custom designed dry bar. The bar, a statement piece in its own right, was designed by Ruffino Cabinetry and boasts a four-tiered glass enclosed upper bar cabinet with Subzero refrigerator/freezer drawer combo and additional storage below. The master bedroom –— in fact, every room -— is flooded with light from vertical floor-to-ceiling transom windows artfully framing the woodsy deep green golf course views which continue endlessly in all directions. Another handmade rug from the Mirage collection by Loloi accents the sleek rugged Mesa bedroom furniture grouping by Century. Original art, rustic aged metal lamps, luxurious silk bedding from the Ann Gish collection and a graceful Kentia palm complete the master bedroom decor. The room’s vaulted tongue-and-groove wood painted ceiling with box beam detail adds character, and another layer of the finish detail that is seen throughout this spacious, well designed, beautifully furnished home. Perhaps the most glamorous room in the home is the master bathroom. Behind a solid glass wall sits the room’s centerpiece, a 12’ high marble shower with soaking tub which steals the show. Clad with solid slabs of Calcutta Borghini Extra marble, the shower installation by Classic Stone and Mirek Rutz of Knauf-Koenig Group is a true work of art. 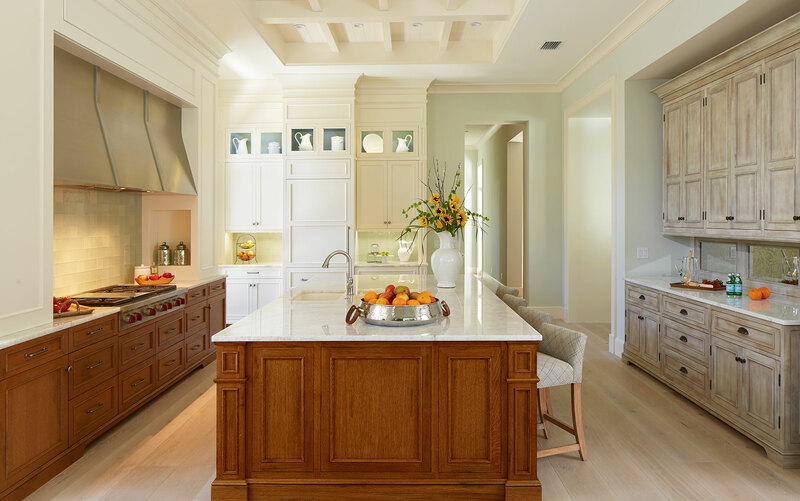 Rift cut white oak cabinetry by Ruffino Cabinetry ties back into the kitchen finishes, and the shell stone on the floors and walls echoes the stone found on the home’s exterior. 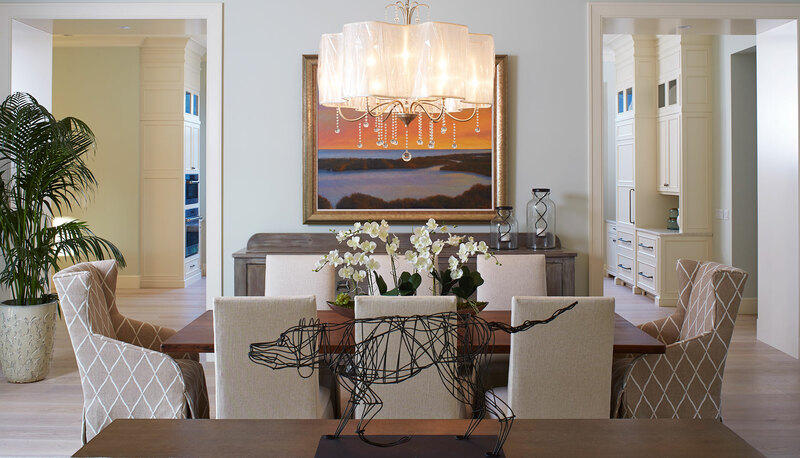 Art from Clive Daniel Home flanks the rain shower, and a stunning Bella Luna chandelier by Currey & Company from Wilson Lighting completes the look. “The master bath was a definite selling feature of this home,” notes Tagliasacchi.